May we never, ever forget the brave men and women of our Australian Defence Force…past and present…and future…. 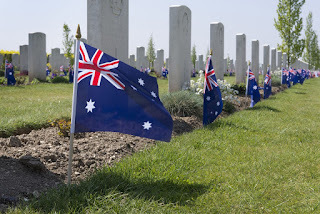 May we also forever honour and hold dear to our hearts those who have stood beside us - our revered neighbour across the Tasman Sea - New Zealand. 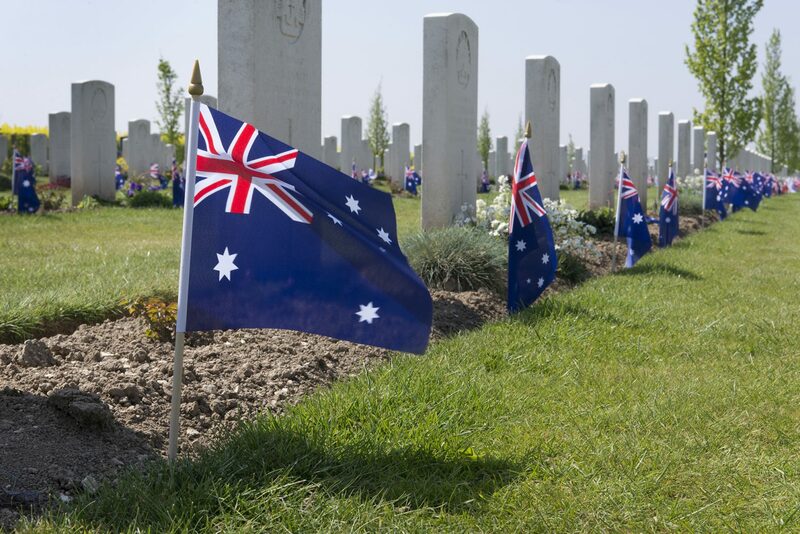 Present and future generations of Aussies must always, unreservedly, be grateful to the members of our ADF – the Australian Army, Royal Australian Navy and Royal Australian Air Force - for their service; for the selfless sacrifices they’ve made, and will continue making…ad infinitum. 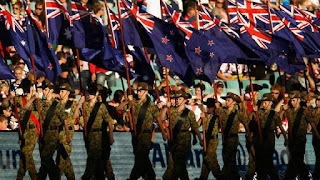 Those in our ADF have my absolute admiration. They always have….my respectful admiration will never cease as long as I live…. 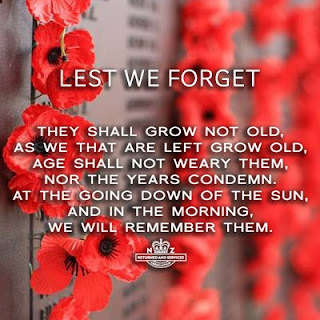 When my late brother and I were children we created wreaths with chrysanthemums and other flowers from our garden to place on Gympie’s Memorial Gates in honour of Anzac Day. 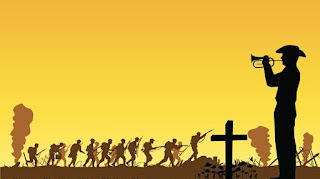 With our grandmother and mother by our sides we attended Anzac Day services. .
Anzac Day I treat with devout reverence. It is our national day filled with raw emotion and pride. Up until a couple of years ago I physically attended our mountain Dawn Service. Although I no longer attend the Service in person, within my four walls I continue my long-held tradition. From 4.30 am forth I’m glued to my television screen. 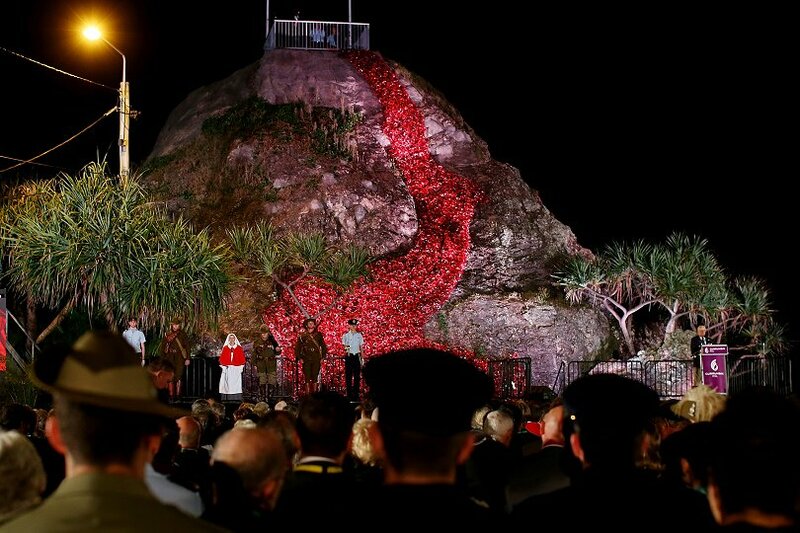 A fitting start to the special, sombre day of respectful remembrance is the Currumbin RSL Dawn Service at Elephant Rock, followed by full coverage of various commemorative events throughout Australia, which includes Brisbane’s stirring Anzac Day Parade; continuing through to Gallipoli Cove’s Dawn Service; culminating with the venerating Dawn Service at the Australian National Memorial in Villers-Bretonneux – the French town re-captured by two Australian brigades and a British brigade from 24th to 27th April, 1918, after the Battles of the Somme. My brother Graham’s and my father, and our uncle, our mother’s younger brother, were the best of mates when they were a couple of brash, strapping, knock-about lads. Together they joined the army. Side by side, they served our country during the Second World War. Our maternal grandfather was an air-raid warden in Rockhampton. In the back yard of their home in Elphinstone Street, North Rockhampton was an air-raid shelter. Nearby neighbours huddled together therein many times. During WWll Camp Rockhampton was a large US Military camp. 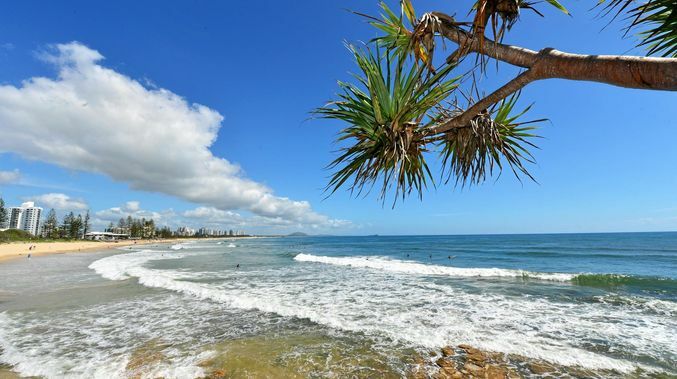 It spread across a vast area of Rockhampton – 22 areas in total. One of our father’s sisters married a US soldier. The couple settled in the United States where their raised their family. I have photos of my father and my uncle proudly attired in their uniforms. Two fit, handsome young men at the time – both have since passed away. The son of long-standing, dear friends holds the rank of Major in our Australian Defence Force. He has seen action in Afghanistan and in the Middle East. I swell with pride when thinking of him. In saying that, I can’t begin to understand the depth of pride his parents feel about their son. I can’t imagine his parents’ concern when he was overseas amidst the arenas of war. 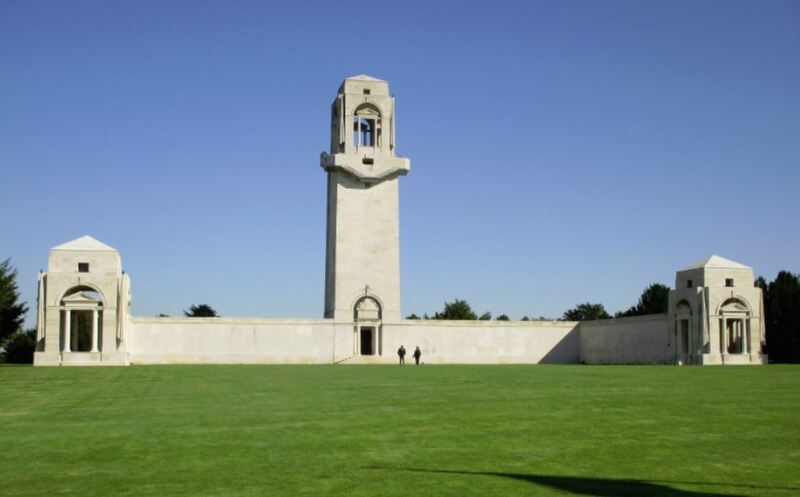 I can’t begin to imagine what any parent feels when their child is among the mayhem and uncertainties of battlefields. From 1976 through to the early 80s I had the good fortune to call the now late David Hackworth, author, military journalist and former United States Army colonel a friend. David was decorated in both the Korean and Vietnam Wars. He earned over 90 US and foreign military awards. After returning to the U.S in the mid-80s David began working for “Newsweek” as a contributing editor on defense issues. He also made regular television appearances to discuss various military-related topics, including the psychological effects of post-traumatic stress disorder. David was a humble man - one who never boasted about his achievements, or the number of medals bestowed upon him. A fine, intelligent man, he had a contagious sense of humour. Generously, he shared his love of fun with those around him. Those whose company he enjoyed. He didn’t suffer fools…not even easily. Sadly, David passed away in 2005, aged 74. He and I shared the same birth date…11th November…Armistice Day. David is interred at Arlington Military Cemetery, Arlington County, Virginia. The brave men and women of our Australian Defence Force, and those of our Allies, deserve our inexhaustible respect. Members of our ADF make sacrifices, as do their loved ones; sacrifices most of us could not imagine in our wildest nightmares. I’ve not seen any rabbits hopping around about the place, but there’s quite a big hare affair going on here, there and everywhere. Yesterday, seemingly, without a care in the world, for a few hours a large hare sat out from my kitchen window. He was either exhausted from spying on me, or contemplating where to hide his stash of Easter eggs. He was wise to my spying on him, of that I was certain. Mr. Hare finally wore me down, and I gave up my covert operation. In case he was eyeing off my rejuvenated choko vine, which has begun sharing its fresh produce with me, I gently tossed - a little west of where the pensive hare was meditating so as not to disturb him – two apples that had become a bit past their bite-by-date, but still in fine, palatable condition. The apples were a special Easter treat for him and his family, given in thanks for being good neighbours. They don’t throw any noisy parties, night or day. There’s no point splitting hares...I love seeing them around the place, as I do the native birdlife, which are varied and many, including the maligned scrub turkeys. Like me, the latter are tough old birds. A smile comes to my face and brightens my morning each time one scuttles across the road in front of my car when I’m on my way to the local supermarket. On a mission, with neck outstretched, head facing determinedly in the direction of its destination, nothing will hinder its purpose – I’m referring to the scurrying turkey, of course – not to me! If the scrub turkeys wish (they are also known as brush turkeys and bush turkeys, depending on which school you went to or didn’t go to) – they are welcome to sit at my dinner table; but they’ll never have a place on my dinner plate. They’re too quick for me to catch, anyway. I can’t even catch a cold...which is a good thing, by the way. The last time I managed to catch a cold was back around July, 1998! They’ve either been too fast for me to catch, or I, too fast for them to capture! 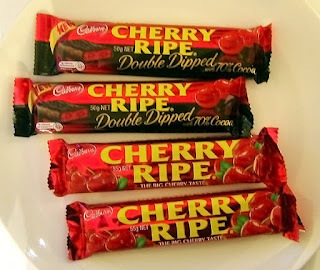 I’ve not yet raided my stock of Cherry Ripes. The temptation is great, though. Like a magnet, my fridge keeps pulling me towards it, but I stop myself halfway. I’m amazed at my self-restraint. For me, Easter has to include Cherry Ripes; just as Christmas must include a load of Liquorice Allsorts. Christmas is the only time I eat Liquorice Allsorts; although, I do eat liquorice – Darrel Lea Batch 37 - throughout the rest of the year. I love liquorice. Sunday mornings throughout our childhood my brother and I attended Sunday School at the Scots Church in Nash Street, Gympie. In those years there were two Presbyterian Churches in Gympie. My brother and I attended the smaller Nash Street church because it was closer to home. Sunday lunch was always an event in our humble household, but Easter Sunday lunches were on par with Christmas. Easter Sunday’s lunch was a feast to behold; to savour and enjoy. The aromas wafting through the air as we raced up the backstairs made our mouths water. 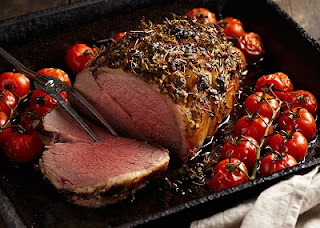 Just the thought of the roast chicken and roast pork or lamb, perhaps beef – two roast meats...chicken and another...were always part of the celebratory fare – along with ham and, naturally, a variety of vegetables - caused us to salivate enough to break a drought! Helping our Nana make the rich, brown gravy was never a chore. Nana was a good cook, and an equally good teacher of same. 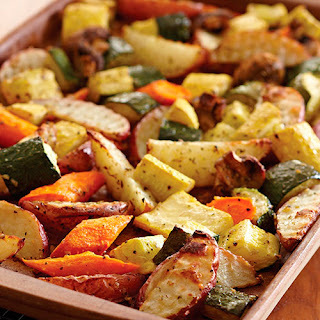 Mum’s responsibilities were setting, decorating the dining table, and the preparation of vegetables to be placed in the oven when the time was right. One of her “chores” was to play the piano while the luncheon preparations were underway. Previously, many times, I’ve written about our mother’s brilliance on the ivories. She was a wonderful pianist...a natural talent. Because the hares have lost interest in my choko vine, on Easter Sunday my delicious, juicy chokos will play an important role in my roasted vegetables...unpeeled and not seeded, of course. The only vegetables I peel are onions. 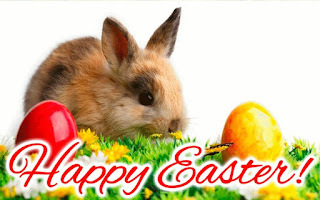 Have a most pleasant Easter weekend, whichever way you choose to spend it, and with whom you choose to share it. I’ll be enjoying Easter weekend with my two best mates....Remy and Shama, who, by the way, have no interest in my Cherry Ripes. Be safe on the roads. However, beware of hares bearing eggs...you don’t know where they’ve been - both the hares and their wares! Herb-Crusted Roast Lamb: Preheat oven 180C. Put 2 large peeled garlic cloves, 2tbs chopped ginger, grated rind of 1 lemon, 2tbs chopped parsley, 2tbs chopped mint and 1tbs chopped fresh rosemary in processor; blast 1min until finely chopped. Add 1 to 2tbs olive oil slowly until bright green mixture forms. Set aside. Place leg of lamb in roast pan with 1 roughly-chopped onion and 1/2c water. Roast...20-25mins per 1/2kg. 30mins before end of cooking spread herb mix all over it. Return to oven. Top up water level if necessary. When cooked throw away the onion; remove excess fat. Add a good dash of dry red wine to pan juices; boil and reduce to a syrup; season to taste. Easter Jaffa Mousse: Heat 100g dark chocolate, 125g butter, 30ml strong coffee and zest of 1 orange on med-heat until melted. Beat 3 egg yolks; slowly add choc mix from a height, while beating; cool. Beat egg whites to soft peaks; slowly add 30ml castor sugar while beating until stiff peaks form; fold whites through cooled choc mix. Beat 125ml cream to soft peaks; fold through the mousse. Pour into 6x160ml serving glasses; chill at least 3hrs. Serve topped with orange zest and........Almond Praline; Line baking tray with baking paper; combine 1/2c castor sugar and 2tbs water in saucepan over low heat; cook, stirring, until sugar dissolves. Increase heat to high. Boil, without stirring until mixture turns golden. Remove from heat. Set aside 5mins to allow bubbles to subside. Add 1/4c slivered almonds. Pour onto prepared tray; cool. 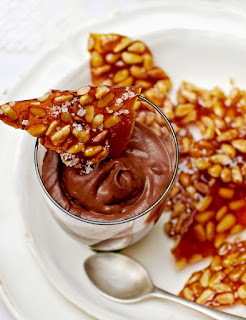 Break praline into shards. Again...you can use nuts of your choice.....peanuts, pine nuts, pecans etc., etc., et al...and eat them all)! In case you’re not aware I’ll draw your attention to something you may have missed because it passed by so quickly - time. Already it’s April, the fourth month! I don’t know about you, but I’m gobsmacked. To where did the first three months disappear? Why so swiftly? 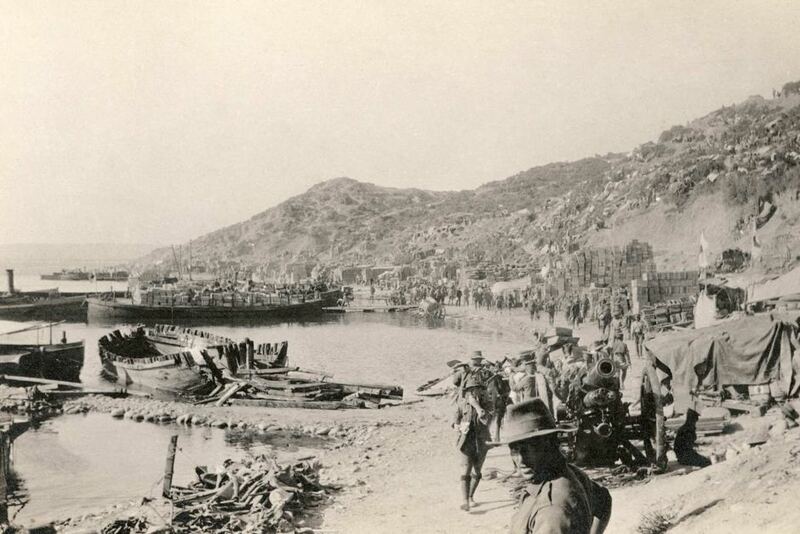 What was so important it caused them to depart in haste, without warning or apology? They could’ve hung around a little longer before being accused of overstaying their welcome! The following fact has already crossed your mind, of course. You really don’t need me to inform you, but - because I can’t help myself - I will, anyway. The evidence is clear to see. Hot Cross buns, bunnies, Easter eggs of myriad varieties and sizes have popped up everywhere – impossible to ignore hints Easter is just around the corner. Actually, Easter is next week. Update alert! My chocolate bunny mate, Clint Lindt, has spent another comfortable year, untouched, safely ensconced in my fridge. His safety is gold-clad. Lately, I’ve been hearing strange noises during the night. Along with songs of joy, Clint hops in tune knowing his existence remains secure as long as I’m around. In chocolate bunny years, he must be almost as old as I am! However, Clint’s more flexible than I am by the noises coming from my fridge. There’s no way I can jump up and down. As for my singing – it’s for my ears only; even they droop at the sound of it. If I was still a teenager my Easter plans would already be set in the sand. 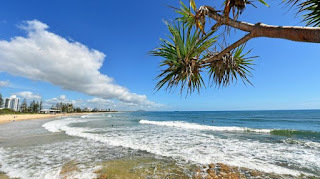 Spending every weekend during spring, summer and autumn at the coast – the Sunshine Coast, that is - my girlfriends and I were well-versed in where to stay, never having difficulty in securing accommodation a hop, step and jump from the beach - at any time of the year. How sweet it was! 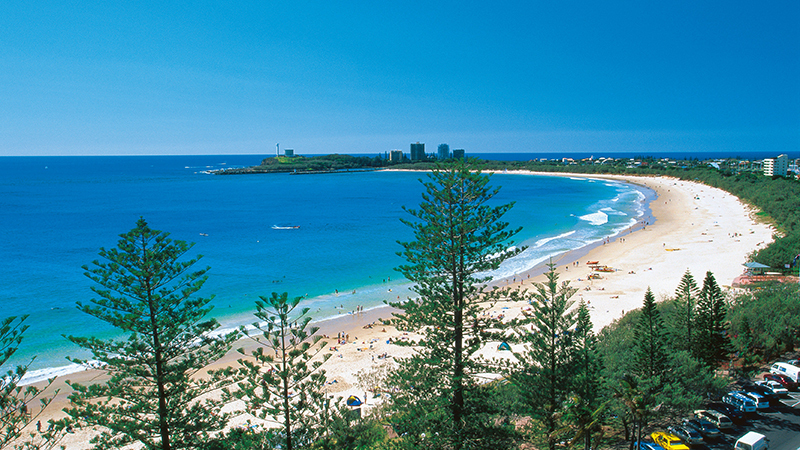 Mooloolaba or Alexandra Headland were our original stomping grounds, but Noosa Heads soon stole our hearts, as did a few of the lifesavers. Ours was puppy-love conducted from afar. ( https://noosatoday.com.au/stories/08-08-2017/pencil-writes-his-name/ (The article is written by Ron Lane. For years Ron was captain of the Noosa Heads Lifesaving Club. Following his lengthy tenure as captain, he then spent many, many years as the club's president. Ron was best man at my first wedding. We remain good friends to this day. 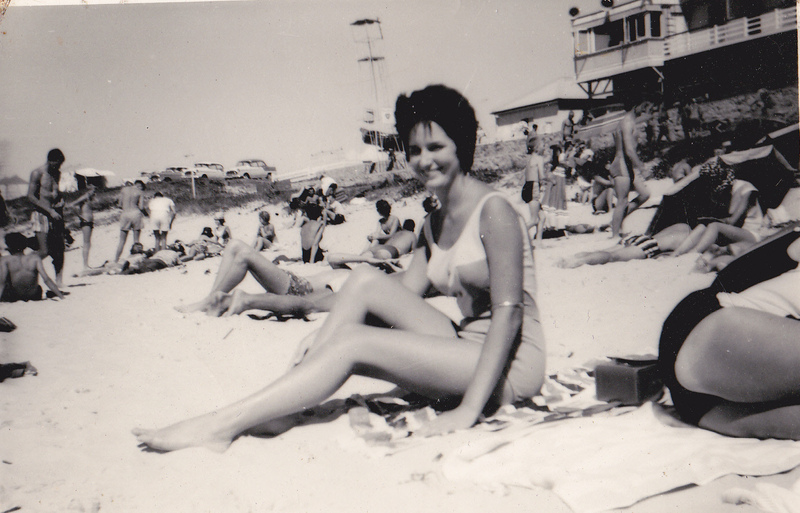 My first husband was a Noosa lifesaver; he, too, and I have remained on friendly terms. For many years...and still does....Ron, who is now 80, has written for the "Noosa News"...the local newspaper. Ron was also a good mate of my late brother, Graham). My girlfriends and I back then when we were teenagers may have been au fait in the art of surfing and sun-baking, but dating didn’t play a major role in our agenda. Our energy was devoted to the joys of the ocean, and rocking at record hops. Being friends with the boys was more important than having boyfriends. 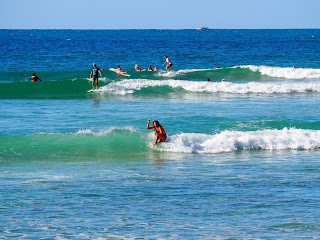 Anyhow, for me, with an older brother, with a watchful eye, who was also a Noosa Heads Surf Lifesaver, he was deterrent enough for any likely lad who may have had amorous thoughts on his mind! Going through old photos and faded newspaper cuttings during my decluttering phase, I found a photo of a friend and me pretend-struggling with a beach umbrella at Mooloolaba. It appeared in a 1961 edition of the “Sunday Mail”. Also among my long-held memorabilia I discovered a photo of a happy quartet taken outside my workplace around 5 pm on Easter Thursday 1963. It featured in Easter Saturday’s issue of the “Gympie Times”. 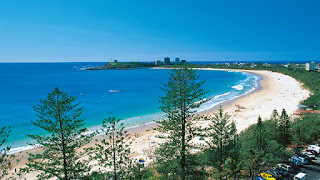 Excited and eager to be on our way to Noosa for the Easter weekend, my three friends and I urged “Brownie”, the photographer, to quickly click so we could be on our way. An impatient Noosa was beckoning. Mr. Brown and I worked together in the same Gympie law firm. I handled all his dictation...in the days I was adept in the art of shorthand. In his spare time “Brownie” was a professional photographer. “Brownie” as everyone affectionately called him was a devoted father of three. He was a well-known, respected local. Coincidentally, years previously, he’d been employed as a clerk at Rockhampton’s Court House around the time I was born. I never did discover if he was the guilty clerk who spelled my name incorrectly on my birth certificate! 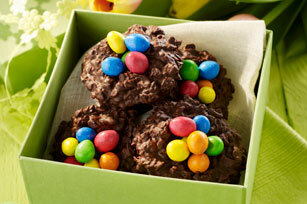 Coconut Brownie Bite Easter Nests: Preheat oven 176C. Grease mini muffin pan. In bowl combine 1c melted, cooled unsalted butter and 1-1/2c sugar. Add 4 large eggs one at a time, mixing after each. Stir in 1tsp vanilla extract. In separate bowl, combine 3/4c cocoa, 1c plain flour and pinch of salt. Add to egg mix all at once; mix until no streaks of dry ingredients remain; add 1/2c shredded coconut. Scoop into muffin pan; fill cups nearly all the way to the top. Bake until set and bounce back when lightly touched, about 15mins. Cool 5mins in pan; transfer to rack to cool completely. Spread 1c sweetened shredded coconut on baking tray; bake in 176C oven until golden, 5-6mins; cool completely. In bowl over simmering water, melt 2tbs butter and 1/2c chocolate chips; stir until smooth; remove from heat. Dip tops of brownie bites into melted choc; return to rack; cover with toasted coconut. Garnish with sugar-coated milk chocolate mini-Easter eggs. Hot Cross Brownies: Preheat oven 160C. Line 28x18cm brownie pan with baking paper. Melt 120g salted butter and 230g chopped white chocolate; cool 5mins. Whisk 3/4c white and 1/4c brown sugar into white choc mix. Add 3 large eggs and 1-1/2tsp vanilla; whisk until smooth. Gently fold in 1/2c plain flour, 1/4tsp salt and 100g white choc chips. Pour batter into pan. Bake 25mins, until top is golden. Cool in pan, set on wire rack. 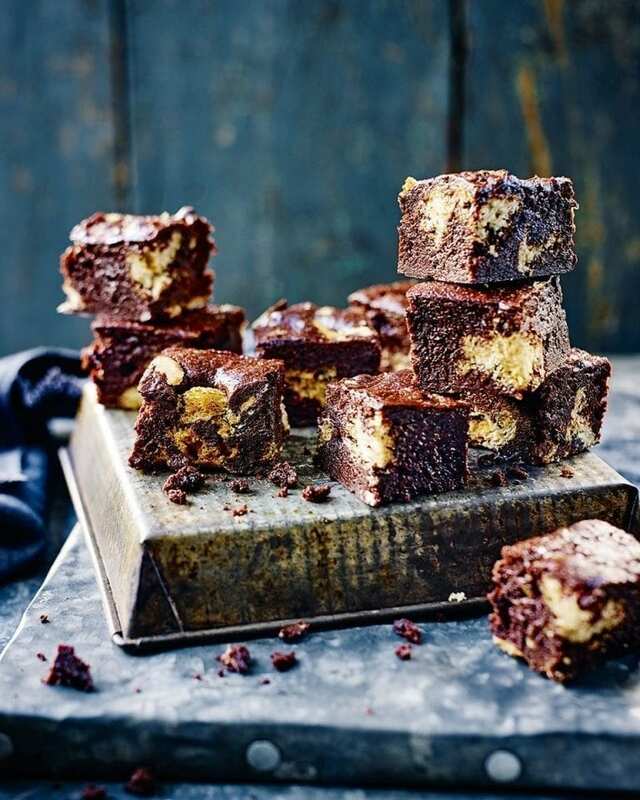 Spread a thin layer of Nutella over top of cool brownie; cut into squares. 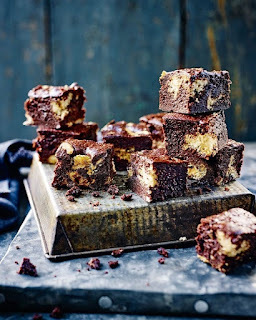 Melt 100g white choc chips; draw neat crosses across each brownie using piping bag or spoon. Crush a packet of Oreos; sprinkle over brownies as desired. 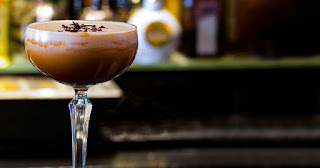 Brownie Martini: Fill cocktail shaker with ice, 28g each vanilla vodka/vodka, crème de cacao, 14g Frangelico and 1tbs cream; shake; strain into martini glass; garnish with shaved dark chocolate. I seek honesty/truth, happiness, peace of mind, perhaps even a kindred spirit if such exists.